This oped co-authored with author Dave Eggers originally appeared in The Washington Post. Secretary of State Hillary Clinton is scheduled to visit South Sudan on Friday, a little more than a year after it seceded from Sudan. Despite all the predictions at South Sudan’s birth that it would become a failed state, the much more vexing problem lies across its border — what to do about Sudan, whose government is responsible for more death and destruction than all of its neighboring Middle Eastern and North African dictatorships combined. Sudanese President Omar al-Bashir, wanted by the International Criminal Court for genocide, exhibits vulnerabilities that marked the final chapters of Egypt’s Hosni Mubarak and Libya’s Moammar Gaddafi. Meanwhile, he is doubling down on a strategy of starving, bombing, and arresting his opponents rather than engaging in meaningful reform. Since South Sudan seceded, Bashir’s regime has reignited the war in Darfur and is dropping bombs on restive populations in Blue Nile state and the Nuba Mountains. It is stoking potential war with South Sudan and is using excessive force against urban protesters; 2,000 people are now under arrest. As Sudanese refugees pour into neighboring countries and new reports of thousands of unaccompanied minors—another generation of “lost boys” and “lost girls”—keep Sudan’s suffering on the radar, it’s time to ask what to do about the Bashir government. How Clinton and other international leaders respond will be crucial in determining whether he hangs on, like his counterpart in Syria, or goes the way of other Middle Eastern and North African dictators caught up in the winds of regional change. Since the National Congress Party came to power in Sudan in a 1989 military coup, the United States and the broader international community have invested in a series of negotiations between Khartoum and its myriad opponents. In nearly 23 years, only once has the regime fully implemented any provision of those numerous agreements: the referendum on South Sudan’s status in 2011. And that took place only because of a massive diplomatic effort, in which the United States, other key countries and finally even China pressured Bashir into accepting the process and its result. Bashir’s coterie in Khartoum stays in power by dividing and conquering its opponents, rather than by opening avenues for their political and economic involvement. The ruling party’s support base inside Sudan is so small that, if it kept to its agreements and allowed opponents to freely participate in elections and governing, coalitions would immediately form to elbow it out of the equation. The regime would have to radically adapt or lose power. Therefore, Bashir is taking no chances that the Arab Spring might be followed by a Sudan Summer. 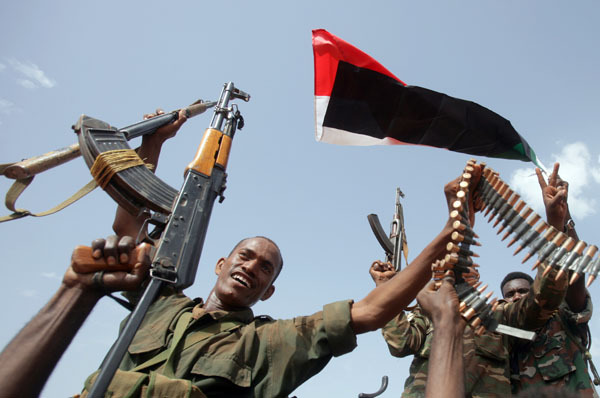 Over the regime’s two decades in power, the central issues surrounding good governance in Sudan—eliminating corruption, promoting democracy, supporting equality and the rule of law, and even ending mass atrocities—have been subordinated in the quest for short-term cease-fires. The deals have collapsed because none of them has addressed the basic violations of rights, which are at the core of every one of Sudan’s conflicts and the current protests. Another peace process is in the works, and it may yield a deal on how to divide oil revenue originating in South Sudan but traveling through Sudan’s pipelines and port. Desperation can sometimes drive compromise, and these are desperate times in both countries. But diplomatic efforts must also address the civil war raging in Sudan, which means zeroing in on the core problem of governance in Khartoum that continues to manufacture war and misery. Meanwhile, though, it’s time for the United States and others to take a stand with those protesting and fighting—and dying—for democracy in Sudan. This support can take many forms, including rapid and substantial support to the Sudanese opposition and civil society, which are working assiduously for real democratic transformation. Washington and others should also work within and outside the U.N. Security Council to create a meaningful consequence for Khartoum’s aerial bombing and humanitarian aid blockade. Now that the specter of mass starvation is looming in Sudan’s war zones, and Sudan’s cities are pulsating with demand for change, the international community must respond more creatively and forcefully, lest an outcome more like Syria than Libya result. If change can be achieved in Sudan, the country could become a catalyst for peace in the region, rather than the engine of war and terror it has been for nearly a quarter-century.